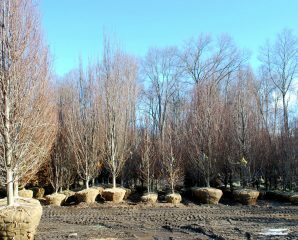 European Hornbeam (Carpinus betulus) have been used in formal gardens and parks for centuries, mainly for their symmetrical habit, delicate texture and soil adaptability. The species will grow 40′ high and wide making a beautiful stand alone tree for along commercial buildings and residential properties. But the narrow growing cultivars seen here, are popular for their fastigiate habit – great for where you don’t have the room needed for wide spreading shade trees or where overhead wires are a concern. They’re fast growers and take well to pruning and shearing, which makes them extremely useful for screening, hedging and pleaching for a more formal look. The leaves turn yellow-orange in fall and the branching silhouette is pretty throughout the winter. Hardy to zone 4 – they can even be used in containers! Plant in full sun to partial shade in average, well-drained soil. Adding M-roots at planting will get them off to a quick start.